I had this idea to use the doors to replace some old wine pictures on one of my kitchen walls. We are slowly working on replacing store bought things in our home with our own home made items. I finally bought some chalkboard paint ($10 at Home Depot), and I scored (again) on some "Oops" paint from Home Depot for just $2! My girls helped me paint the doors. 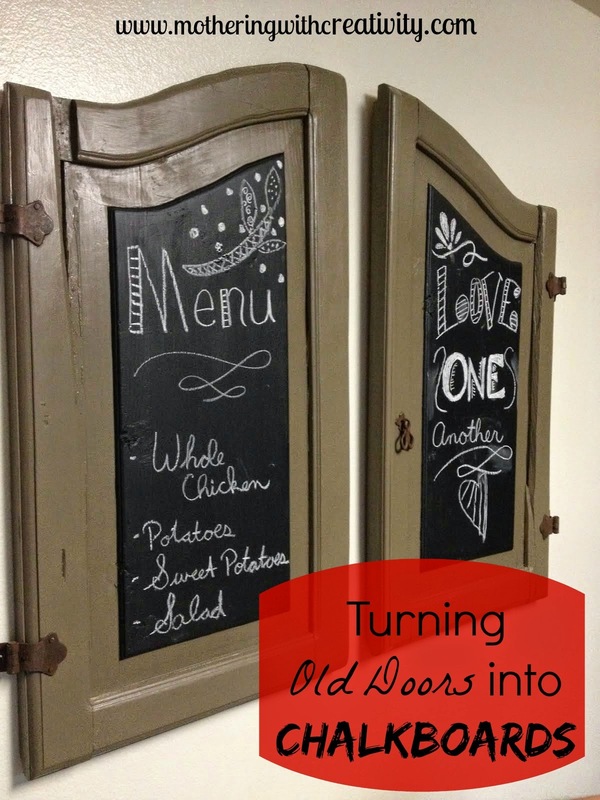 We used the paint for around the outside of the doors, and the chalkboard paint on the inside of each door. Two coats of each was plenty. We let them dry, and then attached hooks and wire to the back for hanging. In the wall, I used a molly and screw to hold the doors securely. They are quite heavy! My favorite part about these doors is the old, original hardware. They are so unique! I also really like the cracked and chipped pieces of wood in various spots....they are definitely one of a kind!